Is the pen mightier than the laptop? The latest business craze seems like a throwback to a bygone era. Basically, it's writing stuff down. Google "Bullet Journals" and you'll see that within a few years of Rydell Carroll introducing "BuJos," they've become all the rage. People are "discovering" the power of a neatly organized notebook to jot down notes, remind themselves of appointments, and create task lists. It's an "analog system for a digital age." After years of filling legal pads, a few years back, I decided to go digital, putting my life into a software application that promised to sync my tasks, notes, and calendar into one giant, color-coded system. Instead, it became a monster to feed—never there when I needed it but pestering me with incessant reminders of overdue tasks. So, I recently came crawling back to the analog fold, finding new religion with my Bullet Journal. Now, my mind feels sharper, my days more focused, and my stress lessened as I put the messiness of my life back into neatly lined pages. This led me to wonder—does something magical happen when we write stuff down? Should we encourage students to embrace handwritten notes? Let's look at some research. According to Beesley and Apthorp's meta-analysis (2010), showing students how to take effective notes is strongly correlated with better achievement. One study from 20 years ago (when computer notes would have been an unaffordable oddity) tested college students to see if taking notes supported retention of factual knowledge (Beeson, 1996). It did: the note-taking group scored better than a group who took no notes during the lecture, but later wrote essays about what they'd learned. The note-taking group also outscored a control group who reviewed the material but did no writing at all. In short, we're more apt to remember stuff we take notes on. The laptop seems like a perfect tool for taking notes. After all, most people can type faster than they can write and thus should be able to capture more of what's being said with less effort. Yet therein lies the problem. As it turns out, note taking isn't supposed to be easy—nor a transcription of classroom discourse. It's more important that learners actively engage in learning by considering the essence of what a speaker is saying and including that essence in their notes. [L]aptop use can negatively affect performance on educational assessments, even—or perhaps especially—when the computer is used for its intended function of easier note taking. Although more notes are beneficial, at least to a point, if the notes are taken indiscriminately or by mindlessly transcribing content, as is more likely the case on a laptop than when notes are taken longhand, the benefit disappears. … [D]espite their growing popularity, laptops may be doing more harm in classrooms than good. In short, students ought to shut their laptops and write stuff down. At issue here seems to be something cognitive scientist Daniel Willingham (2003) has noted: "students remember … what they think about." For students who are efficient typists, laptops may make it easy to mindlessly record what they hear, instead of thinking about what they're learning, mentally connecting dots and focusing on what's most important. Moreover, digital devices may tempt students to think about other things besides learning, like formatting or messages from friends. The very act of handwriting appears to have important cognitive benefits. For example, a study of 15 children in Indiana (James & Engelhardt, 2012) who were asked to write, trace, or type letters while having their brains scanned found that writing letters activated more regions of the brain than typing letters—in particular, visual processing centers at the heart of perceiving letters. Because of these and other cognitive benefits of handwriting, occupational therapists Stevenson and Just (2014) concluded that it's best to hold off on teaching keyboarding to children until ages 10 to 12, after they've fully developed the ability to write by hand. But what about computers as a writing aid for children with learning disabilities, who might benefit from being unburdened of the fine motor skills writing requires? Again, the easiest path isn't necessarily the most beneficial. Berninger and colleagues (2009) studied 2nd, 4th, and 6th graders with and without learning disabilities. They found that all groups wrote more words, and wrote them faster, by pen than by keyboard. The students with learning disabilities sometimes found it easier to touch a letter or form a word on a keyboard, but they composed text better with a pen. The take-away: Young children don't need computers to learn to write (except, of course, for children with disabilities that make it not possible for them to use a pen/pencil). If anything, computers seem to get in the way. For those who haven't been taking notes, let's review. Note taking is an effective memory and learning aid because it prompts students to think about their learning; it's more effective when done by hand; and young writers, even those with learning disabilities, aren't well served by moving too quickly to keyboarding. So, does technology have a role to play in teaching writing? Sure. Many teachers, for example, report success with blogging and online journaling, which help kids collaborate and motivate them to improve their writing because students see themselves as "real" writers with an actual audience. Yet we ought to consider something that often gets scant attention: what's going on in students' minds while they're learning. When we're clear about that, we can more easily consider whether a new gadget or digital platform will enhance or impede active learning—and when it might be time to put technology aside, encourage students to listen up, think about their learning, and write stuff down. Beesley, A. D., & Apthorp, H. S. (2010). Classroom instruction that works, second edition: Research report. Denver, CO: Mid-continent Research for Education and Learning. Beeson, S. A. (1996). The effect of writing after reading on college nursing students' factual knowledge and synthesis of knowledge. Journal of Nursing Education, 35(6), 258–263. Berninger, V. W., Abbot, R. D., Augsburger, A., & Garcia, N. (2009). Comparison of pen and keyboard transcription modes in children with and without learning disabilities. Learning Disability Quarterly, 32(3), 123–141. James, K. H., & Engelhardt, L. (2012). The effects of handwriting experience on functional brain development in pre-literate children. Trends in Neuroscience and Education, 1(1), 32–42. Mueller, P. A., & Oppenheimer, D. M. (2014). The pen is mightier than the keyboard: Advantages of longhand over laptop note taking. Psychological Science, 25(6), 1159–1168. Stevenson, N. C., & Just, C. (2014). 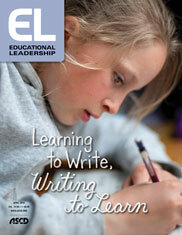 In early education, why teach handwriting before keyboarding? Early Childhood Education Journal, 42(1), 49–56. Willingham, D. (2003). Students remember … what they think about. American Educator, 27(2), 37–41. Bryan Goodwin is president and CEO of McREL International, Denver, Colorado. He is the lead author of Balanced Leadership for Powerful Learning (ASCD, 2015).